Located in the peaceful Turtle Tail area, Sandy Shore has direct beach access, a private onsite swimming pool, a kayak, and numerous water sports nearby. There are five little islands that are just a few hundred yards from the private beach, and turquoise waters that are just a few steps away. You can relax here… with unpretentious surroundings and jaw dropping views of the turquoise sea. 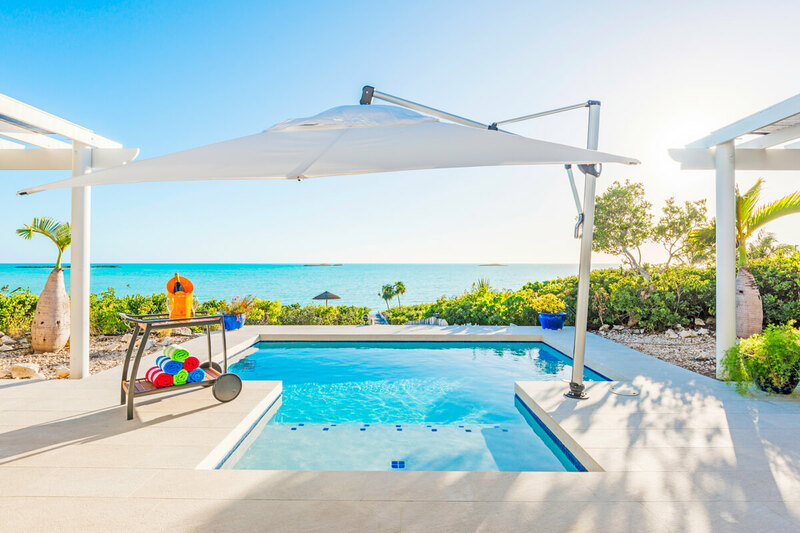 Sandy Shore is a fully air-conditioned beachfront 4-bedroom villa surrounded by Providenciales’ turquoise waters. Nestled into the serene Turtle Tail region, Sandy Shore offers guests complete privacy without sacrificing convenience. Sandy Shore Villa is bordered by water on both sides, and its beachfront pool enjoys wide open stunning sea views. The swimming pool has built-in lounge shelves, and there’s an outdoor shower for guest use. Two covered pergolas on each side of the pool provide ample lounging space and some protections from the sun, and the large, outdoor dining table is ideal for informal meals. A stone pathway leads down to the beach, and there’s a sitting area where parents can watch kids splashing in the sea. Guests can take the complimentary kayaks out on the water, then grill dinner on the gas BBQ. Clean white decor with wood accents and a neutral color scheme adds elegance to the spacious, open-plan living and dining area. An 18-foot sliding-door system with slide-away screens opens the area to the pool and ocean view. Guests can stay entertained with satellite TV, VCR, DVD, and a surround sound stereo system. The gourmet kitchen is fully equipped with stainless steel appliances and top-of-the-line cookware. The master bedroom has a king-sized, four-poster bed and French doors opening to the pool patio. It also has a walk-in closet and his/her ensuite bathrooms. One has a jacuzzi tub overlooking the pool, and the other has a large, tiled shower stall. The guest bedrooms are identical in size, each with a queen-sized bed and ensuite bathroom. Sandy Shore has a 24-hour monitored security system so guests can have peace of mind while on vacation. Grace Bay is only 10 minutes away, and you might even see JoJo the dolphin when visiting Princess Alexandra Marine Park. Guests are given $400 for usage towards electricity and A/C usage. AC/electricity is metered. Any overage will be charged to guests at market rate. Any Car rental, private chef, butler, server, daily maid service, grocery and beverage shopping (pre-arrival and during your stay), liquor and wine delivery, nanny service, baby equipment, spa services, yoga and personal training, photography, and private airport transfer/car service can be arranged for an additional fee. Sandy Shore was everything it claimed to be. It’s beautifully sited, with a great view and private beach access. Tucked away in Turtle Tail, it was secluded, but only 10 minutes from Grace Bay and 17 minutes from the golf course. Sandy Shore is well kept and very comfortable, with plenty of room for 8 people to spread out. As always, Andrew was spot on with accommodation, dining, and activity suggestions. Hope, the property manager, was also very pleasant and quick to respond to questions and concerns. Our stay at Five Little Cays exceeded our expectations. The villa itself was beautiful, with beautiful views of the ocean. It was clean and laid out well for the four of us. Having separate bathrooms and showers for each of us was a nice benefit after being in the pool and water all day. The outdoor shower was also very nice. We used it after swimming in the ocean off our private beach, then headed right into our pool for more swimming. The amenities of having satellite TV, music inside and out, and all the necessary cooking items added to the experience. The property the villa is on is absolutely gorgeous! The beach is quiet with hardly any other people around, and swimming in the calm and shallow turquoise waters was perfect! Overall, this weeklong stay at the Five Little Cays Villa was an experience we will never forget and would love to repeat. Five Little Cays was amazing. It was everything the pictures showed and more. Our group couldn’t have been happier with the location and accommodations. This was my first trip out of the country and Andrew and WhereToStay.com made it an amazing experience. No stone was left unturned from booking our villa to arrival and departure. Any questions were answered promptly and everyone involved was so helpful and gracious. I will definitely go to Andrew and WhereToStay.com for my next trip. We had a great time at Five Little Cays! It was very clean and comfortable, nice beds and fantastic that it was on the water! It is definitely a quieter area away from the main resorts, and we really enjoyed that. It was a short drive to shopping and groceries, as well as many restaurants. Would recommend! Great experience, easy to book, add payments, inquire about amenities. Beautiful location and couldn’t ask for more from the Villa. Beach, Pool, amenities were all top notch. One of the best experiences I’ve had dealing with a vacation planner. We were initially looking at going with a Concierge service but after speaking with Andrew and his wealth of knowledge about the villas, things to do and places to avoid there was no question how we were going to book our vacation. I hesitate to write a review on this property because i really don’t want anyone else to know about it, or choose it! For us, we didn’t want the more populated Grace Bay, so this private and very small little beach was perfect for us. The water was relatively shallow and very warm (at least in summer). Get a 4x4 as the roads to the house are shale. Shopping: The IGA in Grace Bay was nicer than the other one. Go to The Wine Cellar to stock up on your alcoholic beverages. Andrew at WhereToStay was perfect from the very first phone call to the very bitter end. Andrew was so very patient with me while i picked his brain about several different villas and discussing pros and cons for each. Our villa experience was first notch. There was a representative waiting for us at the airport and the villa was clean upon our arrival. We got a flight cancelled the day we were supposed to leave and Andrew was able to use his connections to locate 3 hotel rooms for us at the last minute for our group. We will most definitely use Andrew again for future trips.